A comfortable Full or Full XL sized college blanket is just what you need in your dorm room. Our super cozy Full/Full XL dorm blankets will provide you with incredible comfort and warmth when you wrap yourself up. This college throw blankets are designed to fit a Full or extra long Full sized dorm bed but you can also place them on any of your college furniture. 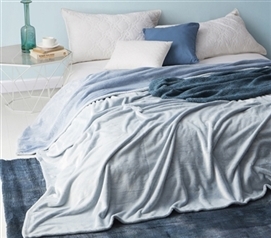 Having such a soft and cozy Full/Full XL blanket on hand in your dorm room is essential! Soft and plush, these must have Full and Full XL college blankets will make a big impact in your dorm room. Our college throw blankets are all comfortable additions to your Full/Full XL size bed and your dorm room furniture. These one of a kind Full/Full XL dorm blankets are also a great addition to your stylish college decor. Choose the perfect color of dorm throw blanket to give you essential comfort on any piece of your college furniture.